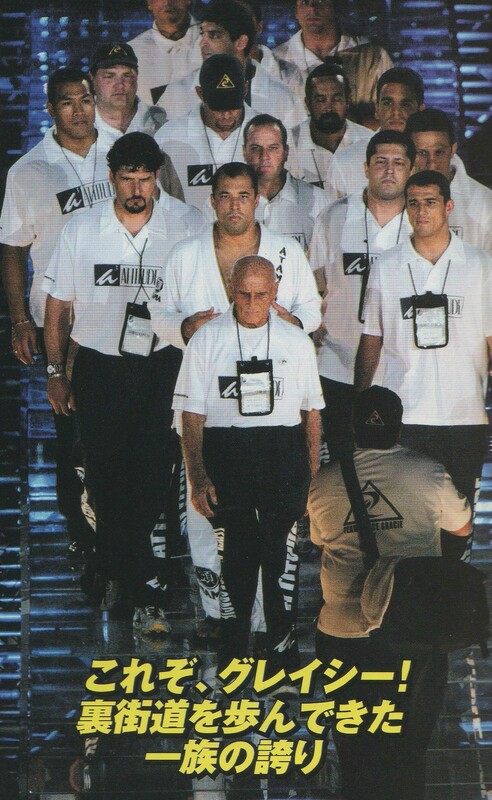 When in 2002 the Japanese promoters decided to stage a fight commemorating the legendary 1951 Kimura versus Gracie match in Rio, who were they going to call? Royce Gracie of course. Royce was the Gracie point man. It was he who led the "Gracie Invasion" in 1993. Royce was the first UFC champion, a feat he repeated twice more. He wasn't the best Gracie, let alone best Brazilian, but he was the best known outside of Brazil. Royce paved the way, blazed the trail, set the standard, and demonstrated the possibilities (all master-minded by his Machiavellian brother Rorion, of course). Among all those kooky cosmic energy focusing Brazilian names, Royce was the one everyone knew. The August 28, 2002 Royce vs. Yoshida match was promoted as a Jiu-Jitsu vs. Judo challenge, explicitly as a reprise of the Kimura vs. Helio Gracie match in October 23, 1951. The 1992 Barcelona Olympic 78 kg. judo Gold medalist Hidehiko Yoshida [吉田秀彦] represented judo. 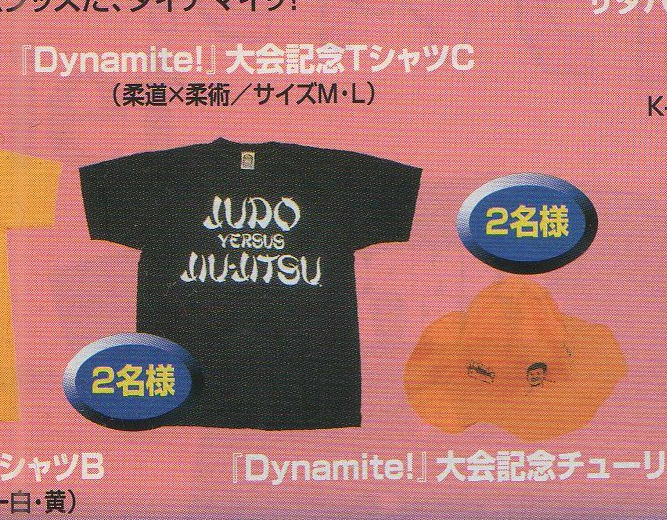 Pride sold Judo versus Jiu-Jitsu T-Shirts to promote the contest. Yoshida was not a washed-up, out of shape, has-been. He failed to repeat his gold winning performance in Atlanta (1996, 5th place in the 86 kg. class), and Sydney (eliminated in the 3rd round of the 90 kg. class). But he was actively competing (at least one major competition every year) and most recently took 2nd place in the 100 kg. class in the 講道館杯日本柔道体重別試合権大会 [Kodokan Cup] in November 2001. In other words, the 22 kgs. he put on since Barcelona was not blubber, but represented his current competition weight. It was not going to be Royce vs. Remco Pardoel Part 2. "this fight can be considered as a reprise [再現] of the 1951 match between Masahiko Kimura and Helio Gracie. 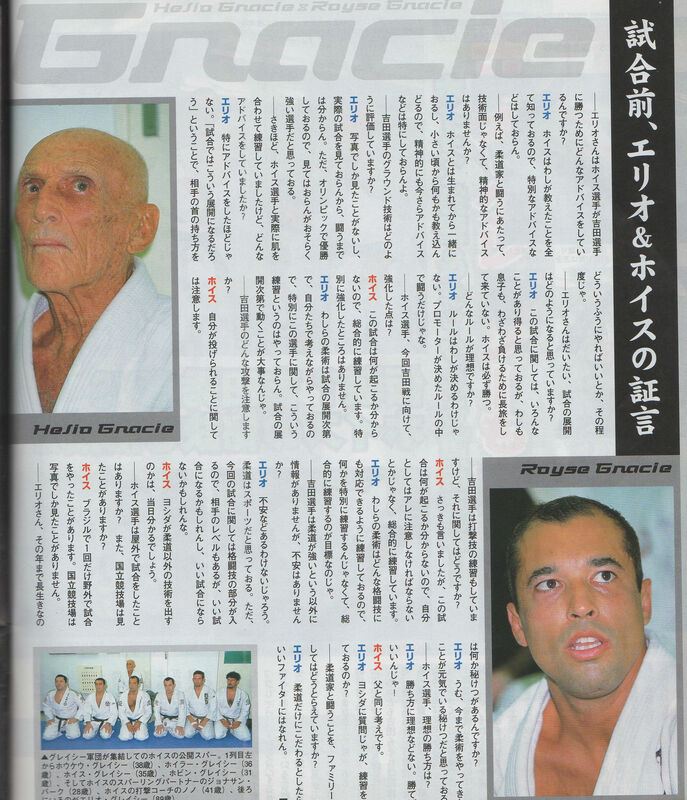 It will be a revenge match [リベンジマッチ] for the Gracie's defeat a half-century ago." After all, this will be the sequel to the story of the legendary style versus style  Kimura vs. Helio death match  at Maracana . What kind of fight was that really? Let's look into history. Below, the cover of the August 8, 2002 issue of SRSDX framed the challenge like this: ”柔　（やわら〕は術か？道か？それが問題だつ！["Is Ju (yawara) a technique or a way? That is the question"]. Below, Yoshida's and Royce's pre-fight comments (SRSDX 8-8-2002, p. 21). There were also numerous longer interviews (see below). Well, Olympic or big matches, you know, I've been fighting in lots of people watching. But there will be more people than that this time, I think. I just want to do what I have been training in Judo so far. Well, I think I will do training based on judo. Choking or submissions is the only way to finish him, so the question is how to get him into the position to do it. Q: What is your impression about Royce? Yoshida: He is taller than I thought. As far as newaza, having long legs is an advantage for submissions or triangles. My legs are short. I felt he is a pro fighter. This year is the 50th anniversary of my father's jiu-jitsu match with Kimura so I proposed to Pride the same rules (that Helio and Kimura used), meaning no striking and ground only with three rounds for 10 minutes. This might be the only opportunity for it to happen. I want to invite as many as possible of the Gracie family to the event, even Rickson. Vale tudo rules are good but this is Yoshida's first NHB fight so I thought it would be better to have a judo vs. jiu-jitsu match. 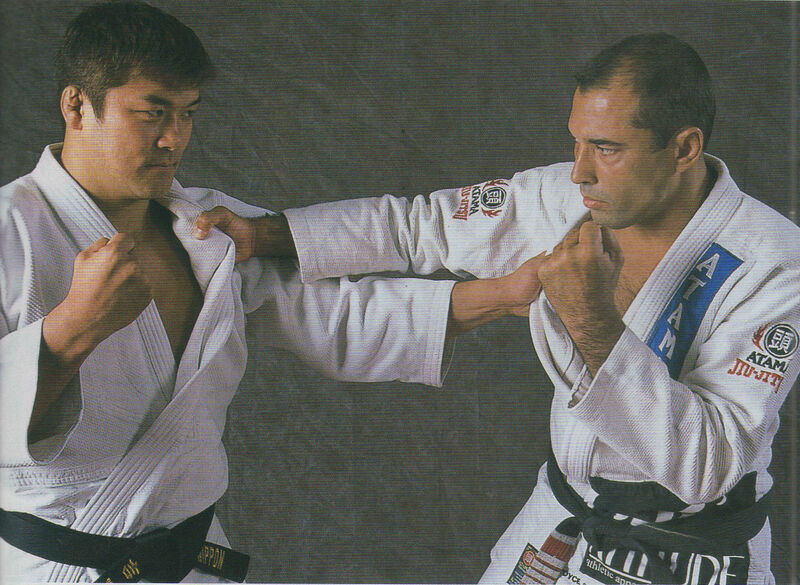 Below, Helio (wearing his blue belt) and Royce Preparing for Yoshida's "Judo". Above: Captions read: "Helio on fire" (right, red letters); "Royce, be on guard against throws!" (left, green letters). Below: Royce's Brain Trust. From left to right are Rolker, Royler, Royce, Robin, Royce's sparring partner "Jonasen" and his boxing coach NoNo. Helio is standing behind Royce. Below, briefs excerpts from Gong Kautougi interview (conducted prior to, but published after, the fight; full interview here). Q: By the way, I heard that you recently went to see Oscar De La Hoya who is the five weight divisions boxing champion. Royce: You really do know alot! [laugh]. He was a good guy. Through the introduction of an acquaintance, I went to his boxing camp, and compared or learned training methods with each other. When I told him "After the fight　why don't you come to my place to learn how to choke", he said, "in that case, I'll teach you how to punch". Q: If it really happens, I want to go there for interview for sure. Yoshida was surprised to see how tall you are. Below: Helio and Royce give "testimony [証言] before the match. [Note: The interview was conducted before the fight, but for some reason, published after the match, in the September 26, 2002 issue of SRSDX, p. 92, shown above]. Q: Mr. Helio, did you give Royce any advice about how to win the match with Yoshida? Helio: Royce knows all of my teachings, so there's no special advice that I need to give him. Q: For example, rather than technical advice, didn't you give spiritual advice, when fighting a judoka? Helio: He was with me all the time since he was born and throughout his childhood so there's no need to give him spiritual advice at this point. Q: How do you evaluate Yoshida's technique on the ground? Helio: I've only seen photographs, I haven't seen him in action in a real fight　However, he won an Olympic gold medal, so I think he's probably a strong athlete. Q: A little while ago, you were training directly with Royce. What advice did you give? Helio: Nothing special. Nothing to the extent of "do this in the fight" or "you should grab the opponent by the neck like this". Q: Mr. Helio, how will the fight unfold? Helio:　I think a lot of things can happen, but me and my son didn't come all this way from Brazil to lose. Royce will win for sure. Q: What kind of rules do you want? Helio:　The rules are not up to me. I don't decide the rules. Q: Royce, in the Yoshida fight that you are about to do, what are you concentrating your training on? Royce: In this fight I don't know what will happen. So I'm training everything. I'm not concentrating on anything in particular. Q: What kind of attack from Yoshida are you on guard against? Q: Yoshida is training striking techniques too. What about that? Royce: As I said before, since I don't know what will happen in the fight, so I'm not concentrating on a particular attack, but I'm training everything. Helio: Our jiu-jitsu prepares us for any kind of fight. We aren't doing any special training. We are training everything. Q: Since nothing has been reported about Yoshida's strong points other than judo, aren't you nervous? Helio: We aren't nervous, of course. Judo is a sport, I think. But taking account of the part of MMA included and the level of the opponent, it will might or might not be a good match. Royce: If Yoshida has any skills other than judo, we will find out on the day of the match. Q: Have you (Royce) had any outdoor fights before? And have you ever seen the National stadium? Royce: Only once in Brazil. I've never seen the National Stadium, only pictures. Q: Mr. Helio, you have lived a long time. What is the secret of your long life? Helio: I still train jiu-jitsu. I think that's why I'm still healthy. Q: Royce, how would you like to win? Helio: There isn't a preferred way to win. Any win is a good win. Royce: I think the same way. Helio: A question for Yoshida: "Are you training?" Q: In a fight with a judoka, what does your family think? According to the SRSDX (August 8, 2002, p. 8) profile, Yoshida was born September 3, 1969, in Aichi-ken [愛知県]. He began training judo in his 4th year of primary school and never stopped. Currently, he is a judo 6 dan [６ 段], stands 180 cm., and weighs 100 kg. His blood type is O [many Japanese people erroneously believe that blood type correlates with personality]. His judo competition career is summarized on p. 11, highlighted by the 1992 Barcelona gold medal. He also won a gold medal (90 kg.) in the October 1999 Birmingham World Judo Championship. Q: The first time you saw Gracie or a UFC video, what did you think? Yoshida: Beating is involved. I wondered if I could do it. Q: Did you know Gracie Jiu-Jitsu? Yoshida: No, I didn't know it. Only recently. Q: You watched the first UFC video, of course, didn't you? Q: Did it have an impact ? Yoshida: No. nothing special. But in judo, during ne-waza, use foul, using the sleeve or the pants hem in judo chokes is foul. but it isn't foul in jiu-jitsu. They use the parts of dogi skillfully. Q: But, didn't you think, the first time you saw a video, "hey, this is judo". Yoshida: Almost. It's judo, you know, isn't it. Q: When the world strongest kakutogi was decided under any style, sumo or karate or boxing , anything came out. To you , at that time, was it natural that judo was the strongest, or it was surprising to see that judo was really strong, which is it? Yoshida: I have been doing only judo. Q: So you thought it was natural? Yoshida: Well, it's difficult to say, because I've done only under rules, and in judo punching and kicking are not permitted. But I felt I could use on ground what I have done in judo. Q: You think from the first that judo is the strongest under "no rules"? Yoshida: No, I don't know about that, you know. You might get hit with a "lucky punch"[ ラッキパンチ] or something, maybe, right? Q: But except eating lucky punch, judo is strong, you think so? Yoshida: No, I don't know, I've never done it before. But I feel during training that no-gi is different from usual. Q: Did you start judo with that fantasy? Q: For example, in childhood time, there was a comic book titled "karate baka ichidai" , about what was the strongest kakutogi, karate or pro wrestling. What did you feel at that time? Yoshida: No. I didn't have that kind of interest. Q: Ah, maybe it is nothing interesting to people who are aiming at Olympic with judo. Yoshida: In those days there wasn't anything like MMA, so I didn't have any strong interest. But now, it is becoming a popular "brand" with a lot of attention. When I see a match, I feel "maybe I can do it ". Q: You wanted to try. Q: What do you think about Gracie? When you were aiming at Olympics, on the other hand they were doing a non-mainstream styles of judo, in other words, judo how to win in "school vs. school" [他流試合], away from Olympics. What is called, they were pursuing only techniques to win. Yoshida: We don't know much about it, so put it in the opposite way, it scares me a little. Yoshida:　Yes, because I don't know what to expect with techniques that I'm not familiar with. Yoshida (laughing): Well, when it's time to lose, it's time to lose ["まあ、負けたら負けた時ですよ"]. Q: For example, when you compare with a fighter who is a kicker and a fighter who is a wrestler, isn't Gracie somehow special? Because he's a representative of a sub-style of judo. Don't you have a special desire to not lose? Yoshida: For sure you know. Their wining style is almost ground. Royce doesn't win by kicking or punching much, you know. Q: Have you seen the Mr. Masahiko Kimura versus Helio Gracie match? Yoshida: No, I haven't seen it. Q: This match (Yoshida vs. Royce) is that kind of match. Isn't there some history behind it? What do you feel about that historical background to your fight with Royce? Yoshida: Nothing. I don't care. It is being said like that, but for me, it doesn't mean anything (laughs). I can't be mentioned in the some breath with Kimura-sensei. Yoshida. Well now, I think it was fantastic. Q: Is there anyone you absolutely want to fight? Yoshida. No. I don't want to fight anyone (laugh). Q: How about Saku-chan or Nogueira? Yoshida: Nogueira is really strong. By fighting with Royce, I will see what it's like. Then I might feel another challenge, but I can't think of anyone at this point. Q: Gracie established Gracie Jiu-Jitsu, it seems. Will you make "Yoshida Judo"? Yoshida: No, I only learned judo. 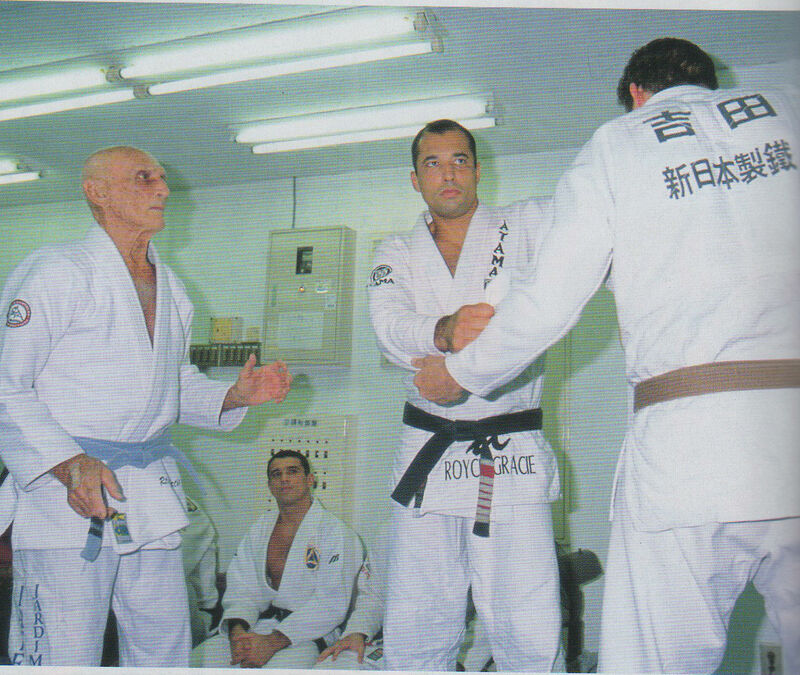 Roberto Pedreira had an unexpected opportunity to interview Mario Sperry in Tokyo on August 6, 2002. Zé Mario was in town with the Nogueira brothers, Murilo Bustamante, and a lot of other very big guys, for the UFO event to be held August 8. Roberto asked Zé Mario who he liked for the Royce Gracie versus Yoshida Hidehiko Judo x jiu-jitsu "revenge" match. "Royce will win," Zé Mario predicted confidently. Yoshida is a great judoka, but unlike the days when Kimura was touring Brazil, when Japanese judokas were very strong on the ground, judo players since the 1964 Olympics have lost their feel for the floor. Royce will not have a problem with Yoshida on the ground, Zé Mario explained. But might Yoshida knock Royce out with a powerful throw? "Everything is possible, but it won't happen," Zé Mario said. Above, Gracie Train approaches the ring. Below, Yoshida Train approaches the ring. 1. Actually the Invasion began in 1987 and Royce was not particularly prominent, see Jiu-Jitsu in the South Zone appendices 1 and 2 (transcripts), and Gracie Invasion January 13, 1987 and Gracie Invasion July 27, 1988 (synopses and commentary). 2. Although in Brazil in 1951, the Kimura vs. Gracie match was not represented as jiu-jitsu vs. judo. The São Paulo Japanese community called it a 国際柔道大会 [International judo Tournament]. What it was called in Rio depended on who did the calling. 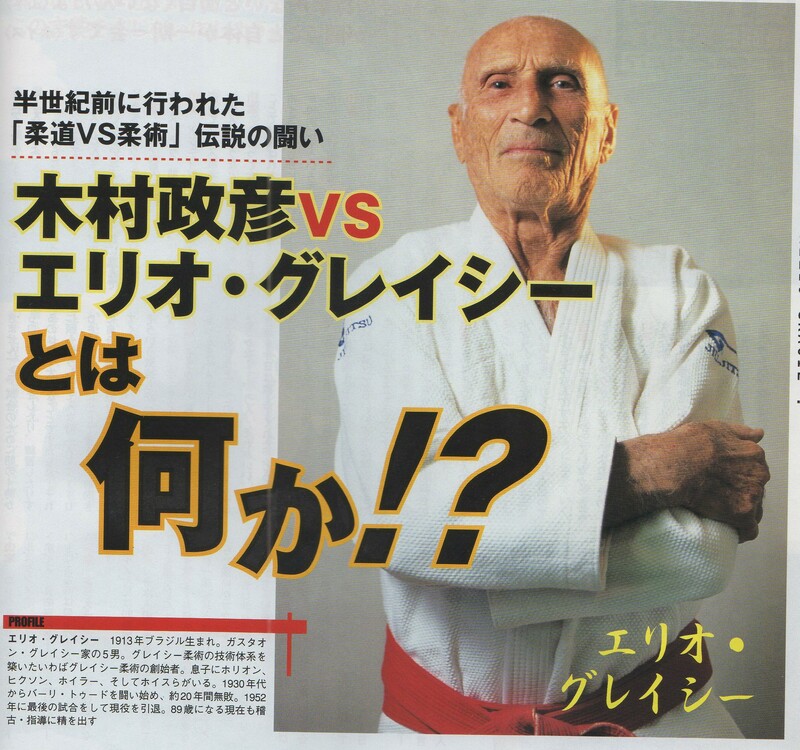 Helio Gracie described it as a contest of Japanese judo versus Carioca sportsmanship, among other things. In reality it was a submission grappling contest in kimonos (see Choque 2, chp. 2 for details). 3. No offense intended to Remco; he was a good judoka, albeit far from Yoshida's caliber. The point is that Remco went into the fight with not much awareness of what he was facing. Yoshida however had the benefit of expert coaching from Tsuyoshi Kosaka [高坂剛] and was tactically well-prepared for Royce's jiu-jitsu. Kosaka understood the Brazilian game from his own matches against Antonio Rodrigo Nogueira (2000), Jean Jacque Machado and Rolles Gracie (both in 2001), and numerous high-level submission grapplers. Yoshida obviously had a realistic assessment of what Royce would try to do. 4. Ishii-kanchô is Ishii Kazuyoshi [石井和義]. Kanchô [館長]　means "head of an organization". People with special social positions or roles are generally identified by their position or role, or (when disambiguation is required) by their family name + role title (e.g., X-sensei (X teacher、X-先生), Y-senshu (Y+選手、Y-athlete), Z-shachô、 (Z-社長, Z-Company President), Kurosawa kantoku (黒澤明監督, movie director Kurosawa), and so on. Note that a circumflex (hat symbol) over a vowel indicates a long vowel (pronounced the length of two ordinary vowels, or, in practice, with greater stress). Vowel length is phonemic in Japanese, meaning that an otherwise identical word with a short vowel has a different meaning from one with a long vowel. For example, "o" [short o, written お] has a different meaning from ô [long vowel, usually written おう]. An alternative Romanization convention is to write long vowels with a macron. Words that are commonly used in English are written as they are conventionally spelled, e.g., judo, sumo. 5. Death match is 死闘. In a previous sentence he used the word 対決 (confrontation, showdown, face-off, challenge). 6. Style versus style, or "challenge" match is 他流試合. The 他 (pronounced "ta") in 他流試合 means "other" or "different." By "styles" we mean ryû [流]. The writer considers Brazilian Jiu-Jitsu to be a "ryû". Ryû refers to a teacher (and staff in some cases) and his teachings (which may be slightly different, very different, or not at all different from those of a different ryû). And since Kimura's "style" was Kodokan judo, Brazilian jiu-jitsu is, to this writer, a style of judo. To avoid confusion, note that there was another "style" of judo, between 1895 and 1946, as practiced by the Dai Nippon Butokukai [大日本武徳会]. More accurately, they were judo as practiced by two partly competing, partly cooperating organizations (the Butokukai included other martial arts as well, and was abolished by Douglas MacArthur in 1946). Kosen judo [高専柔道] as well, was a set of competition rules (allowing more time for ne-waza), not a separate style or organization. 7. Maracana Stadium, in Rio. 8. Translated with a Buddhist expression,一期一会. 10. Photos on pages 90-91 show that Royce was training take-downs, punches, kicks, gripping (or throwing), and (apparently) countering throws. 11. Royce might have been referring to the match with Wallid Ismail December 17, 1998. See Choque 3, chp. 38. 12. The National Stadium [国立競技場] is where the fight was scheduled to be held. 14. Karate Baka Ichidai　空手馬鹿一代, literally "karate fool generation". 15. The interviewer refers to the Gracie style as "Back Alley Do" [裏街道]" and ”underground judo"[裏柔道] and as a judo sub-style [亜流]. The 亜 in 亜流 [pronounced "ah"] can mean sub- or related; in this sense, present day international judo is also a "sub-style" of the original Japanese Kodokan [講道館] and Dai-Nihon Butokukai [大日本武徳会] judo. The interviewer refers to judo as the legitimate faction [正当派], implying that the Gracie's Back Alley Do is not legitimate--perhaps heretical, renegade, and heterodox (or at least "unorthodox....but effective", see here). 16. As noted above, and described fully in Choque 2, chp. 2, Kimura and almost everyone else in Brazil considered it a judo match, but with non-standard rules, i.e, submission only. 17. The interviewer refers to Sakuraba Kazushi [桜庭一志] as Saku-chan. Chan is typically used to refer to or address children. Nogueira is Antonio Rodrigo Noguiera. (For informative interviews with Kazushi Sakuraba and Antonio Rodrigo Nogueira, see Interviews). 18. 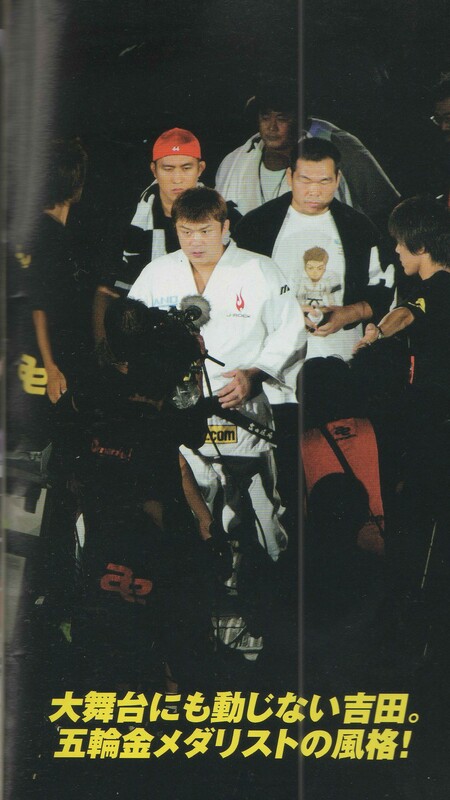 We get the impression that Yoshida doesn't know much about the history of MMA, or the Gracies, and doesn't care. The interview went on for six pages, long by Japanese magazine standards, with the interviewer basically trying to get Yoshida to say something sensational, or that judo is best, occasionally chiding him for acting too much like an "amateur" and not being "dramatic" enough. Yoshida however was reluctant to play along, or simply hadn't developed his "marketing" skills]. Thanks to veteran MMA translator Yoko Kondo [近藤洋子] for checking the translations and suggesting some improvements. Her translations of interviews with Helio Gracie, Sakuraba, Rickson Gracie, Caol Uno, and many more can be found here]. (c) 2016, Roberto Pedreira. All rights reserved. (c) 2016 Roberto Pedreira. All rights reserved.